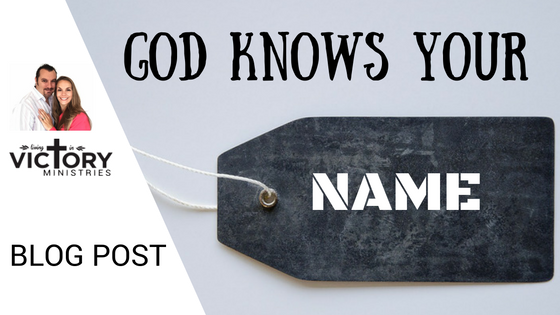 Christian Blog God knows your name. Did you know that God really knows you? In the world today with all its hustle and bustle, it’s easy to feel like you are forgotten or unknown. However, God really and truly knows you. You were fearfully and wonderfully made. God knew you before you were formed in your mother’s womb. He knows when you get up and when you go to sleep. He even knows the thoughts you are going to think before you think them. He knows everything about you (see Psalm 139). You are not forgotten, in fact, you are God’s handiwork and you were made for the purpose that God has prepared for you. He has good works already set up for you to do (see Ephesians 2:10). The Bible says that God knows the plans He has for us, plans to prosper us and not to harm us, plans for a hope and a future (see Jeremiah 29;11). You have a future and it’s good. Did you know you are so amazing that God even thinks about you? That’s right, Psalm 139 tells us that if we were to count the thoughts that God thinks towards us these thoughts would outnumber the grains of sand on the seashore. It’s amazing to think about just how much God knows us. He knows and loves us so much that our names are even written in His book. Luke 10:20 and Revelation 20;15 both speak of God having a book of life that our names are written in. God, speaking of Israel in Isaiah 49:16 says that their names are written on the palm of his hands. God takes knowing His people so seriously that He even puts their names on His hands as a reminder just how much He loves them. You and I are His people too and I am sure He does the same thing for us. God knows us so well that He knows exactly how many hairs are on our heads (see Luke 12:7). I have been married for 11 years to my wife, she knows me better than anyone on the planet. But I can guarantee you that she has no idea how many hairs are on my head, granted there may not be that many anymore, but still, she has no idea how many there are. We are known by God. All of our days on this earth are even mapped out by God. Job 14:5 and Psalm 139: 16 tell us that God has numbered our days. So the next time you are tempted to think that no one really knows you, just remind yourself that God knows you. He loves you and has never forgotten about you. There is nothing that can separate you from His love and you are His chosen child, born for such a time as this. Today I encourage you to meditate on and think about the truth of just how intimately God knows you. He knows your name so don’t worry about people who don’t. We also have this blog post as a video.